If you love nuts as much as I do for a snack or garnish, you may be interested to know that nuts like almonds, walnuts, pistachios and pecans are not just delicious and have that crunchy appeal, they are incredibly nutritious. And science tells us so. Everyone should enjoy the experience of eating modest amounts of nuts every day. They contain fiber and minerals like selenium and vitamin E, not to mention a good source of healthy fat. I love adding them to my oatmeal or my cottage cheese. You may have started to hear more and more about the Mediterranean diet these days. It has been a popular subject for people who are looking for a healthier approach to eating. Not only that, but its popularity hit an all-time high when many celebrities and media personalities started talking about the benefits, too. One of the most popular components of this diet is extra-virgin olive oil. Nuts go along with the Mediterranean diet because they contain the same kinds of fats that olive oil does. Much like olive oil, the consumption of nuts can also reduce your risk of getting certain chronic diseases. If you are concerned about your risk of type 2 diabetes, eating nuts can reduce the risk considerably. One study presented at the recent European Congress on Obesity included research compiled from European and American data. The review found that people who eat nuts as a part of their diet can do just that. According to the report, individuals who consumed 57 g of pistachios daily for four months reduced their blood sugar, insulin secretion and insulin resistance. Those who didn’t consume the nuts showed no noticeable results in this regard. Other research has shown that the consumption of foods like nuts and olive oil can reduce blood cholesterol, triglycerides and even reduce blood sugar. Eating nuts can also reduce blood pressure, inflammation, blood clotting and reduce the formation of glycation. Glycation occurs when blood sugar and insulin levels are raised for extended periods of time during the pre-diabetic period. Glycation causes sugar molecules to bind to proteins like hemoglobin which helps to carry oxygen to your red blood cells. 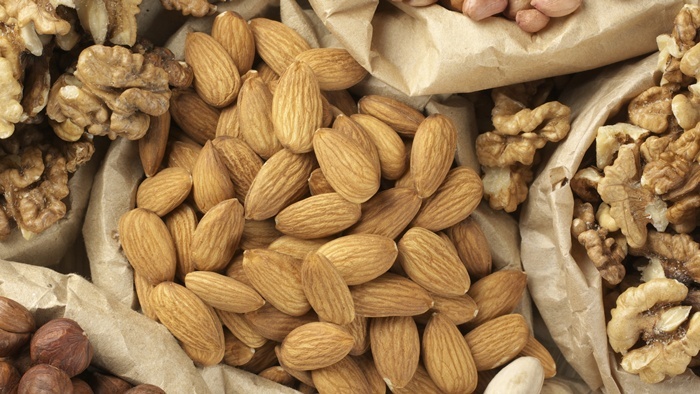 Nuts have been shown to improve the way your insulin works. I am all for the idea that food can be a fantastic healing tool. When it comes to nuts—almonds, Brazil, pecans, you name them—there are so many reasons to incorporate them into your diet. Not only are they delicious, but they also can reduce your risk of developing diabetes, heart disease and stroke. Nainggolan, L., “Eating Nuts May Help Pause Path to Type 2 Diabetes,” Medscape website, May 30, 2014; http://www.medscape.com/viewarticle/825957. 2014 European Congress on Obesity, Abstract T5:OS2.3, presented May 31, 2014.